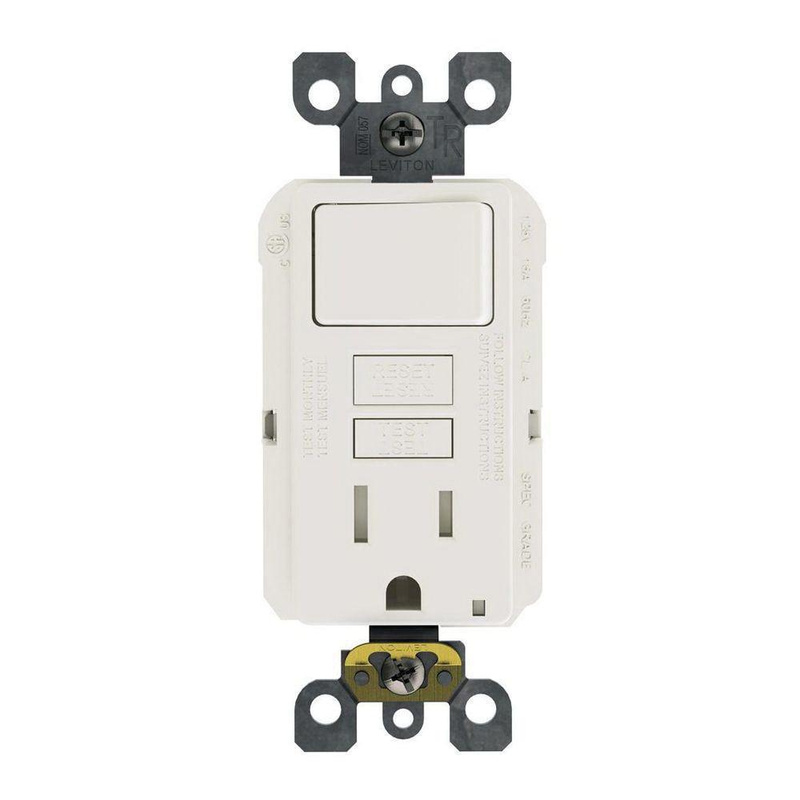 Leviton SmartlockPro® 2-Pole Monochromatic self-test combination GFCI receptacle/switch in white color, has voltage rating of 125-Volts, current rating of 15-Amps and short-circuit current rating of 10-Kilo-Amps. Advanced electronics design of this GFCI receptacle/switch ensures superior resistance to electrical surges and overvoltages. This receptacle/switch has external back-wire clamps for providing visual indication of proper wire seating. It has status indicator light for providing simple intuitive feedback on power and protection status. GFCI Receptacle/switch features polycarbonate body and thermoplastic face for longer endurance. Reduced depth of this GFCI receptacle/switch speeds up installation in any electrical box. This receptacle/switch has brass 0.031 thick double-wipe line contacts for optimal contact and conductivity. It features galvanized steel strap for making mounting easier. It is suitable for use on all with all Decora® devices and wallplates. Receptacle/switch with standard brass self-grounding clip, features side and back-wire termination that accommodates wires of size 14 - 10-AWG. It withstands dielectric voltage of 1250-Volt AC. This receptacle/switch withstands temperature rating of -35 to 66 deg C. It has flammability rating of V-0 per UL94 to withstand harsh environmental conditions. Class-A rated GFCI receptacle/switch has NEMA rating of 5 - 15R for added safety. Receptacle/switch is UL listed and CSA/cCSAus certified.